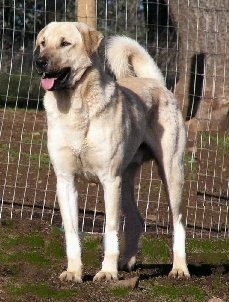 Alec came to us from Northern California, Napa Valley area, from Lost Horizons Kennel owned by Chris and Jill Maxwell. 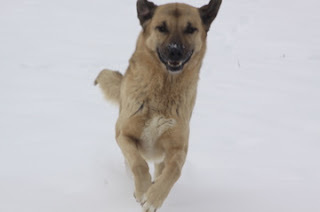 We started Alec off in our home instead of the goat area, but he did go out daily with me to feed the goats and frolic with my other Anatolians. As an adult he does spend time in the pasture with his goats. Alec started conformation classes, at 12 wks., through the Ozark Kennel Club in Springfield, Missouri. 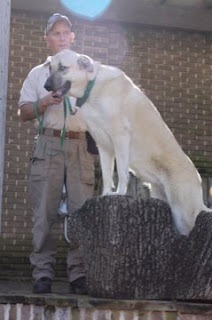 He was our first Anatolian to show AKC. We've had wonderful fun showing him and it encouraged us to continue showing with several of our other Anatolians. We traveled to shows in Missouri, Arkansas, Oklahoma, Wisconsin, Texas, New Mexico and California. 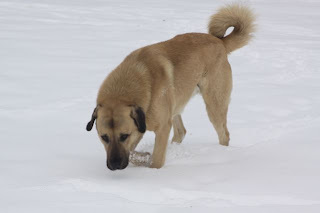 Love this photo of him in the snow. Alec has a wonderful loving character and enjoys life to the fullest. He is sired by Pilotspeak The Scout Master out of Birinci/Night Watch lines and Lost Armadillo's Dream Catcher through CH Gerlach Beau and Orchard House's K.D. 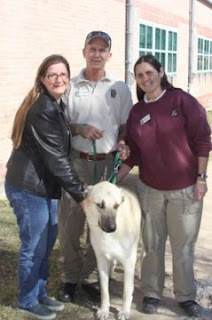 We had the pleasure of visiting the Anatolians that came from us in 2007 at the Houston Zoo. We arrived just in time to view their special presentation for the Cheetah Conservation Fund. 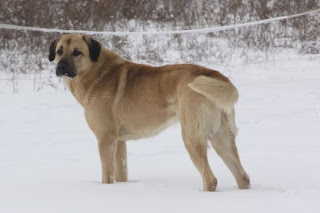 This is Taji, their female Anatolian. 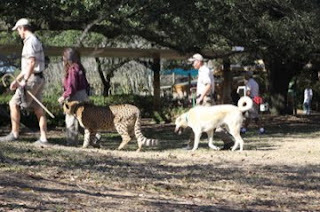 Taji was walked out by one of her keepers along with one of their male Cheetahs. The presentation was informative and enjoyable. Taji and her brother Tusker are 2 1/2 years old. 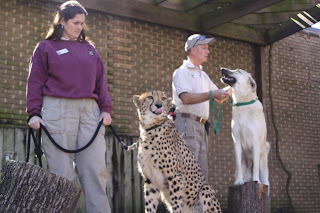 Taji is used for the presentations with the Cheetahs. 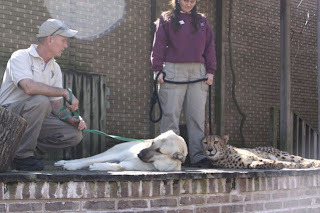 Tusker has developed more of a livestock guardian character who loves Taji and his Cheetahs as well as his keepers. We were able to go behind the scenes and meet Taji and Tusker. They turned out just lovely.